Damn Good Travels: Delivering Books. Delivering Hope. In Sitio Saybuan, Barangay Tinongdan in Itogon, Benguet, Grades 1 to 4 students share a single classroom and one teacher. Students do not mind walking miles on muddy terrains just to reach school. Their uniforms are the work clothes they also use when they attend to their vegetable plots. Resources like textbooks, pencils and notebooks are scarce, yet they continue to be filled with hope. Though reachable two hours by foot from Itogon town proper, the school seems to be separated from the rest of the world, especially when aid is concerned. Upon learning this story, a group of mountaineers organized an outreach program called Trails to Empower Kids (TREK) and approached Diwa Learning Systems with a plea for help. Diwa Learning Systems has been supplying textbooks and scholastic enhancement materials (SEMs) to top schools nationwide for more than 25 years. Together with Bato Balani Foundation, the educational publisher fulfills its vision of a better Philippines with quality education for all. One of its projects is Tulong sa Paaralan, Tulay sa Kaunlaran (TSP-TSK), which provides deserving schools in underserved communities access to quality textbooks and other reference materials. 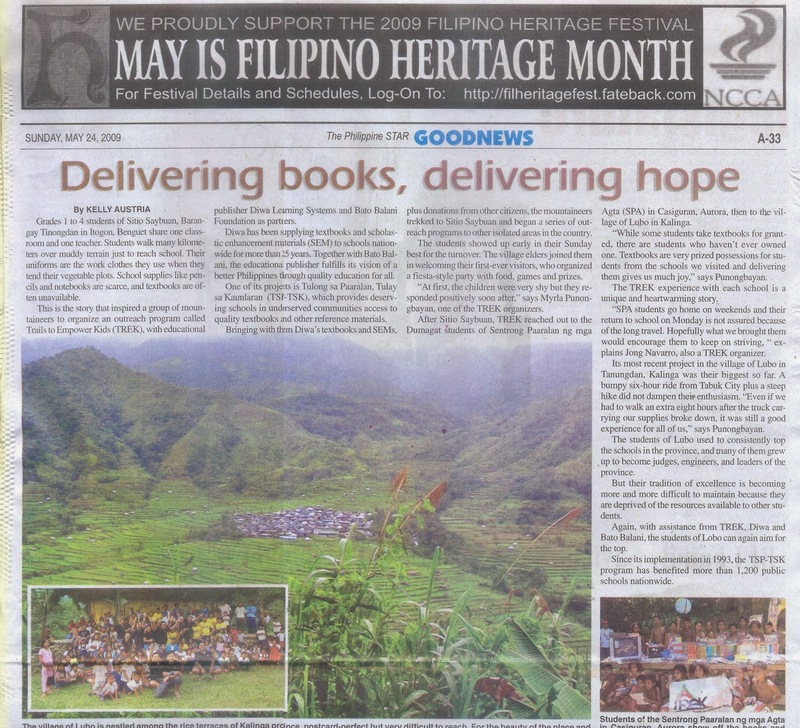 Bringing with them Diwa's textbooks and SEMs, plus donations from other good citizens, the mountaineers trekked to Sitio Saybuan and thus began a series of outreach programs to other isolated areas in the country. The students showed up early in their best Sunday clothes during the turnover of the donation. The village elders joined them in welcoming their first ever visitors, who organized a fiesta style party, complete with food, games and prizes. "At first, the children were very shy but they responded positively soon after" say Myrla Punongbayan, one of the TREK organizers. After Sitio Saybuan, TREK reached out to the Dumagat students of Sentrong Paaralan ng mga Agta (SPA) in Casiguran, Aurora, then to the village of Lubo in Kalinga. "While some students take for granted textbooks, there are students who haven't even touched or owned one. Textbooks are very prized possessions for students from the schools we visited and delivering them gives us much joy" says Punongbayan. The TREK experience with each school is a unique and heartwarming story.
" SPA students go home on weekends and their return are not assured because of the long travel. Hopefully the aid we brought them would encourage them to keep on striving, " explains Jong Navarro, also a TREK organizer. In its most recent project onto the village of Lubo in Tanungdan, Kalinga, the TREK organizers were not daunted by the size of the project, which is their biggest so far. Though a 6-hour bumpy mountain ride from Tabuk City plus a steep hike, the mountaineers proceeded with vigor. "Even if we encountered difficulties like walking extra eight hours after our truck carrying our supplies broke down, it was still a good experience for all of us," says Ms. Punongbayan. 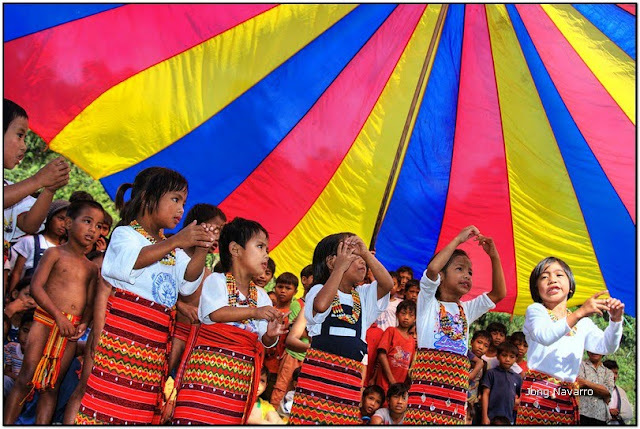 The students of Lubo used to consistently top the schools in the province of Kalinga. The children had to walk long hours each day to get to school. But they were determined to learn. Many of them grew up to become judges, engineers, and leaders of that province. But, their tradition of excellence is becoming more and more difficult for them to maintain as they are deprived of the resources available to other students. Again, with the assistance from Diwa and Bato Balani Foundation, the students of Lobo found new lease on life. Since its implementation in 1993, the BBFI's TSP-TSK program has benefited more than 1,200 public schools nationwide, with a total of almost 69 million worth of donations spread across the duration of the program, now reaching even the most remote areas of the country. For information, log on to www.batobalanifoundation.org and www.diwa.ph.